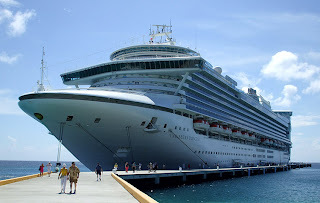 I recently returned form a cruise on Caribbean Princess. The ship is the fourth one to be built on the design first inaugurated with the Grand Princess. There are now ten Grand-class ships - - nine with Princess and one with P&O cruises. All are massive ships ranging from 108,000 to 116,000 tons and carrying 3,000 plus passengers. Their steep white sides tower over you like a building when you are standing on the pier. Although these ships spring from the same basic design, there are differences. Some have more decks than others, some have a pod suspended above the stern that houses a nightclub, and some have what looks like jet engines around the funnel. Along the same lines, Princess has developed new ideas for amenities and facilities over time and consequently, there are differences in that you will find inside the ships. While the line strives to retro-fit the earlier ships with the things that have proven a success on subsequent ships, that process in itself leads to differences. There is also the fact that even physically identical ships have different personalities. This is a function of a host of factors including the captain and the crew. The original personalities often leave their mark on the way things are done on a ship. Subsequent, personalities may make changes but the atmosphere on board will never be identical to that on board the ship’s physically identical sister. Caribbean Princess has a quiet unassuming personality. The ship’s interior is physically attractive and well-maintained. Indeed, there are areas such as the atrium that are quite pretty but it is never overpowering. There is no neon, nothing intended to shock the senses. Things tend to move smoothly on Caribbean Princess. The service in the cabins and the restaurants was good throughout my voyage. Moreover, there was always something going on or something to do. Indeed, I was impressed by the fact that thee were activities on the ship even when she was in port - - a recognition of the fact that for some passengers the ship is the destination. This year, Caribbean Princess is taking over the itineraries done in the past by her sister Crown Princess - - sailing from San Juan in the winter and from New York in the warmer months. Accordingly, I expected to find veterans of Crown Princess on this cruise. While there were some, most of the past passengers seemed to be followers of Caribbean Princess. There was something about this ship in particular that they liked, something intangible. Indeed, it is difficult not to like Caribbean Princess. This may seem like a strange question but do you remember who teh staff captain was on this cruise? The staff captain was Jon Paul Bryant.